Today was supposed to be my day of getting caught up with household chores. Every Wednesday is my catch up day. It's the one day of the week where after school activities are not consuming our afternoon through evening. We had places to be in the early morning but that left our late morning open for simplicity. I'm a fan of simplicity but am terrible at implementation. My fidgety personality prevents me from slowing down. Except today I finally let simplicity take over. I have been ignoring our garden for a while which of course gives me guilt. All those poor vegetables can't weed their own plots. Taking in all of the need to do weeding I finally realized that I'd better get my tomatoes planted. Despite my best efforts at starting tomatoes by seed my seedlings are a month behind. No worries they will find a home in our garden but that does not solve my problem of wanting tomatoes before September. A farmer acquaintance has a farm stand every year in their front yard. This time of year it is filled with seedlings. For weeks I have been meaning to drop by and select a few plants. Today I decided was the day to go get our tomatoes. Adelynn and I wandered the table looking for the 8 plants we thought would be a nice addition to our garden. Let me say the decision was not so easy. It should have been but I tend to over think sometimes and I also tend to lose all sense of reason when it comes to tomatoes. I think 'Sure I have room for 60 plants' when in reality 10 is pushing the limits of space we can give to tomatoes. I had $8.00 in cash so I was very restricted in my choices. Eight plants later we were satisfied with our choices. Adelynn really wanted a watermelon but since we have 6 seedlings ready to plant we agreed on a cantaloupe. I'm not even certain if she felt she was negotiating. All she heard was melon and that seemed to make her happy. I love two year olds for their blissful enjoyment of the moment. I picked out two eggplants with high hopes that these will grow for me. Last year's plant yielded two fruit and then withered away. We needed to choose five tomato plants. Every year I like to grow a couple favorites and then something I've never grown before. I chose two that I love to grow a Roma and Cherry tomato. The girls love the cherry varieties and I can't live without my Romas. The other three plants were some I've never grown nor heard of before. Which is perfect since that makes them so much more interesting to me. I enjoy trying new options. We'll see how these newbies produce maybe they will be a new favorite. By the time we arrived back home it was time to get our lunch started. I have been meaning to make Jamie Oliver's Humble Home Cooked Beans for about a week. Today was the perfect day for getting them made. I soaked some beans over night just to make it that much easier for me to get them made. To begin we gathered the fresh herbs from our garden. Rosemary, thyme, and parsley were snipped washed and ready for being tossed into the pot. I called them our "lunch beans" as Adelynn helped me add the ingredients to the pot. She was so proud to help me make lunch beans. She absolutely loves to cook. Her favorite part was tossing in the vegetables; it may have to do with the big splashes she made. Next time I'll be sure to add the water AFTER we add the vegetables that will save on the wet counter and recipe. I set the beans to simmer while we headed out to the garden. By this point the day was hot. Adelynn decided to play in her water tub. When she asked me if I'd put her in it so her feet could get wet I knew that this was going to be tricky. I wouldn't be able to keep a visual on her 100% of the time while I planted the vegetables and she would need me to help her get in and out of our washtub. She wanted to play in the water and I couldn't blame her. I kind of wanted to plop in there myself. To solve the water play problem I dug around in the garage until I found her wading pool. We set it up near the garden so I could keep an eye on her. She was thrilled to get her swimsuit on. Giddy with wiggles happy. Those of you with toddlers know the giddy wiggle, so incredibly cute it is. After an hour of garden weeding and planting and of course Adelynn's busy work of water play our beans were ready to eat. Adelynn was so excited for lunch. I couldn't figure out why she was so excited because she's not a big fan of eating beans. I found my answer when she said picnic. She was looking forward to a picnic lunch. Truthfully I didn't even think of making it a picnic. Having a picnic made perfect sense. She helped me fill our plates and cups chattering with excitement the entire time. I found a shady spot where we could spread out our beach towels. I set our plates down while Adelynn eagerly sat on her towel. She tried her beans. She did not like them but concluded they smelled very yummy. Ahh toddlers they are fickle eaters indeed. Instead of beans she ate her peanut butter sandwich. I on the other hand really enjoyed my humble beans. It was such an easy meal to make with tremendous flavor. Adelynn gobbled up her food so that she could get back in her pool. I sat there watching her as she enjoyed every minute of that pool. Before long it was 2:00pm and I realized we had been outside for most of our day. The sun and heat were getting to us. At this point I had a very upset little girl who did not want to come indoors for her nap. I understand. I watched her having so much fun I know why she didn't want to stop playing. Despite her desire to remain outdoors she was tired. Dried off and in bed she fell asleep quickly. I felt the urge to frantically complete my list of chores. That overwhelming urge to compete tasks each day tends to rule my days. But today I didn't let that happen. I pulled the wet clothes from the washer put them in the dryer and accepted the task of one load of laundry being done is quite good for me today. I ignored the sink full of dishes, the toys scattered all over bypassed the grass and dirt laden floors and sat in my chair to read a book. I needed to just sit and enjoy a book. Was it productive of me? Nope but it felt great to read for an hour. Reflecting back on the day I was very pleased that it was so simple. No planned activities, no lists of chores to do, nothing pressing. 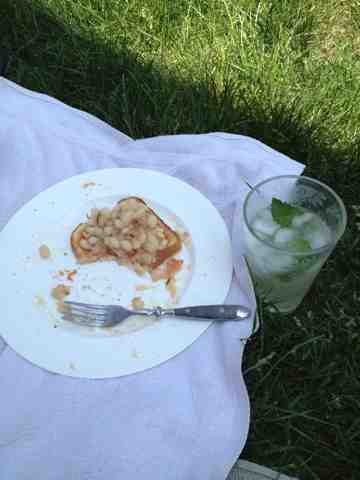 I loved the simple lunch we ate followed by a supper of easy BLT sandwiches on a blanket in the backyard. I think a successful day is a day when the children are happy. To them it was a very good day. To me it was amazing.